Annie and I walk most days up a gravel road through an area that used to be all coastal forest. It lies in the airport flight path and was once planned to be a large recreational complex with a golf course, houses and other buildings, but they were never built. Over the years, we have watched big machines rip out the trees and leave sections nearly bare, but the plants always grow back. The rabbits, deer, cougars and snakes return. However, a couple of the old bulldozers remain. 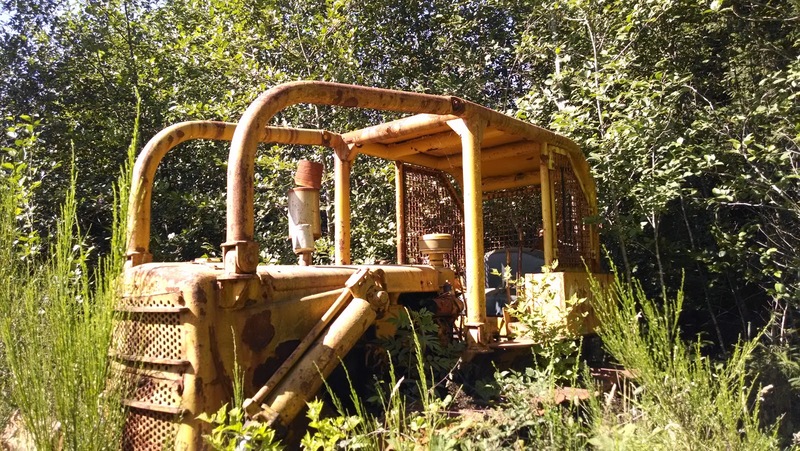 I don’t understand this waste of machinery that just sits there and rots, but they are here, slowly falling apart as the forest reclaims its land. Today I share this picture and poem with you. among which the deer could find no food. but they left their big machine behind. its gears, its knobs, a forgotten glove. seed pods rattling against the rails. Thorny vines wrap around its rotting tires. dances in front of the deadly jaws.